Wind noise was louder than exhaust noise on my car at 70mph. 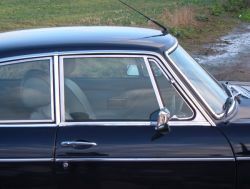 The standard MGB door window is frameless in that the glass is unsupported rearwards of the front quarter light frame. 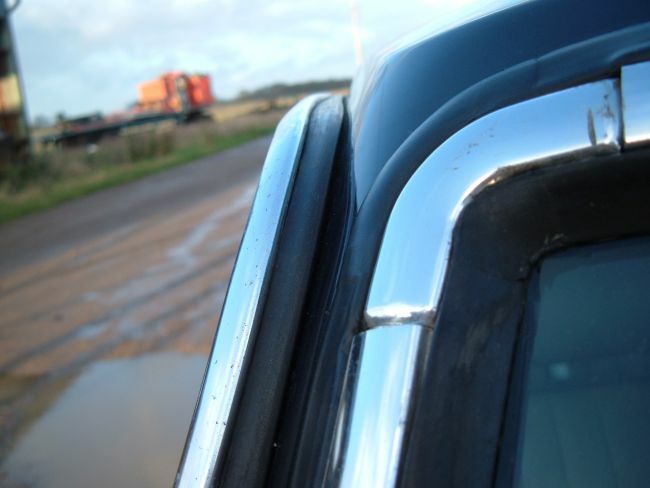 It is difficult to pre-load the glass to prevent it from lifting off the door seal at speed, and if pre-load is applied the glass becomes difficult to wind up past the seal. In addition there is a sharp change in section between the quarter light and the glass which is not matched by the door seal so there will always be a gap to let in wind noise. My solution to both of these issues was to make a frame all around the side glass. I don't recommend this modification to anyone. I thought the modifications would only take a couple of days but they took more than a week. I had trouble finding suitable stainless channel section so I used parts from secondhand quarter light frames. 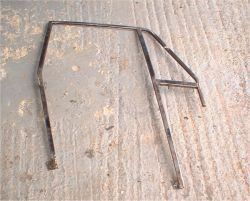 The new rear section is from the main vertical section of a quarter light frame and was cut and welded to form the kink at the waist line. The top section was made up from the leading channels of 2 spare quarter lights. The whole lot was jigged in position on the car, welded together and polished. The main vertical channel at the front of the frame needed to be moved forward by about 10mm to allow space for the glass and the rear channel. The front quarter light glass will still fit but will no longer open so I will silicone seal it into the closed position (I found there was a lot of noise from the quarter light in any case due to the old, perished, and no longer available seal. The original mountings for the channel section to the bottom of the door wouldn't fit through the gap in the top of the door so were cut off and replaced by nut plates. 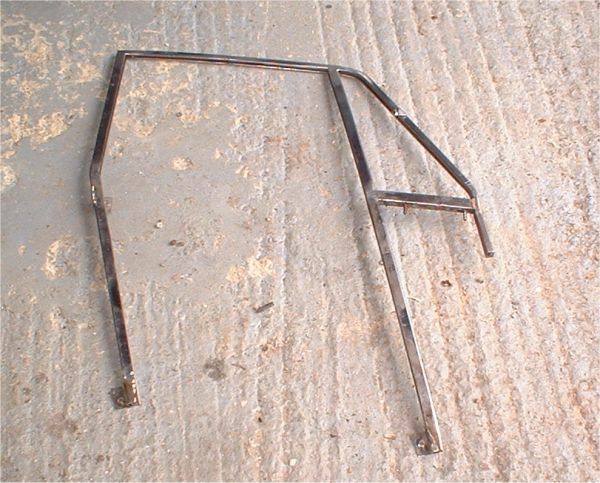 The top of the door needed to be reinforced to stiffen the rear channel mounting, and the body aperture flange at the rear of the door had to be recessed to the inner surface of the 'B' pillar to allow the rear of the frame to sit close enough to the car. 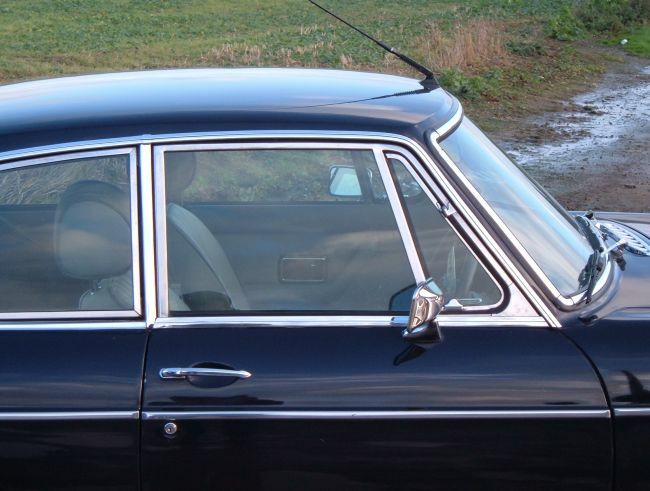 The little stainless trim above the waistline at the rear of the door also needed to be redesigned. I've also tried to reduce form noise by filling the rain channel with an old rubber window runner. Wind noise is now noticeable from 50mph as wisps from the front pillars, but doesn't seem to get much noisier. By 75mph is isn't really noticeable.